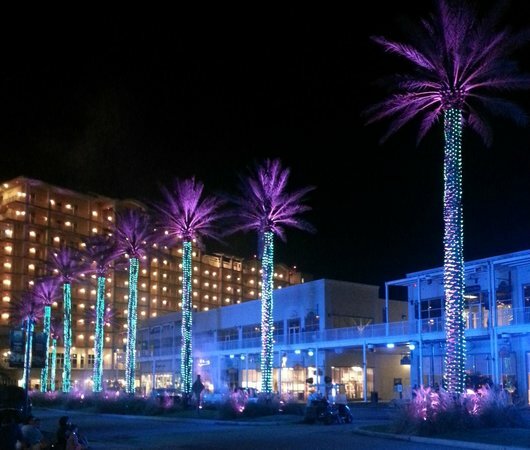 The Wharf Condos are just one part of a rich entertainment district and resort in Orange Beach, Alabama. While the main street of the Wharf is known for its upscale shops, boutiques, and restaurants to please any taste, the Wharf is a major attraction because of its 10,000 seat amphitheater which draws well-known performers and large crowds year-round. The Wharf also sports a 208 slip marina for the boating enthusiast. On days when a summer thunderstorm might dampen the beaches or boating activities, the Wharf’s 15 screen Rave movie theatre will come to the rescue as a family friendly activity along the shopping strip. Continue reading about the Wharf Condos below the listings, or jump to a list of other Orange Beach Condos. Situated on the Intracoastal waterway and built in 2007, the Wharf Condos are comprised of one hundred and ninety units, and are one of the premier resort communities in Orange Beach. Amenities include an oasis, zero-entry sand wave pool, lazy river, hot tub, water slide, kiddie pool, hammock and tiki bar. Families can enjoy it all, luxury shopping and dining, entertainment, and amazing accommodations, all within in walking distance of each other! Units within the Wharf Condominiums are appointed with high-end trim features like granite countertops, designer appliances, and whirlpool bathtubs. The large balconies overlook the marina and are a perfect spot to enjoy the sunset and the natural beauty of Orange Beach and the Intracoastal. After sundown, be sure to take in the dazzling and unique SPECTRA light show and take a ride on the Wharf’s ferris wheel. There is no end to the entertainment at your fingertips as an owner of a Wharf condominium. We can’t wait to hear from you so we can tell you more about the Wharf Condos and all that they offer. Contact us today.